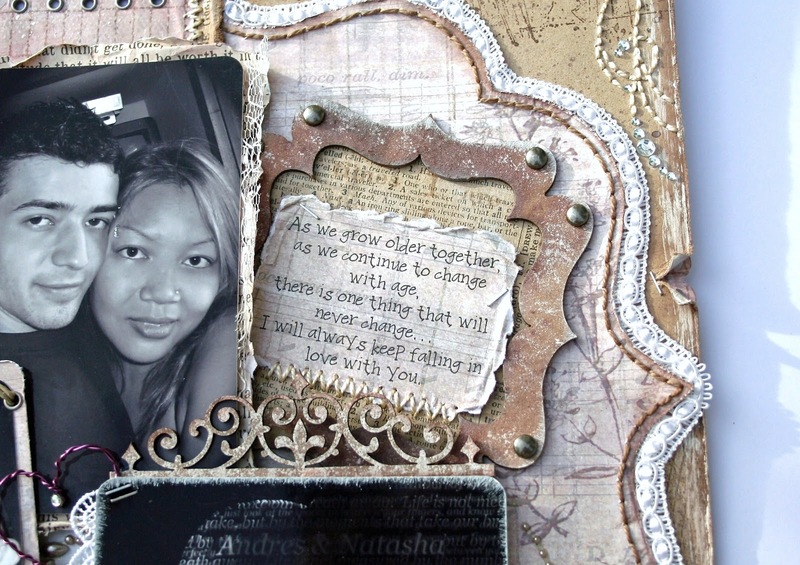 For this layout, I used Donna Salazar's Antiquities Collection as well as a few of her other fabulous goodies. You have probably noticed, from the variety of wonderful projects that my team mates have created, that this versatile collection can be used for so many different themes and occasions. That is why it is one of my faves!! 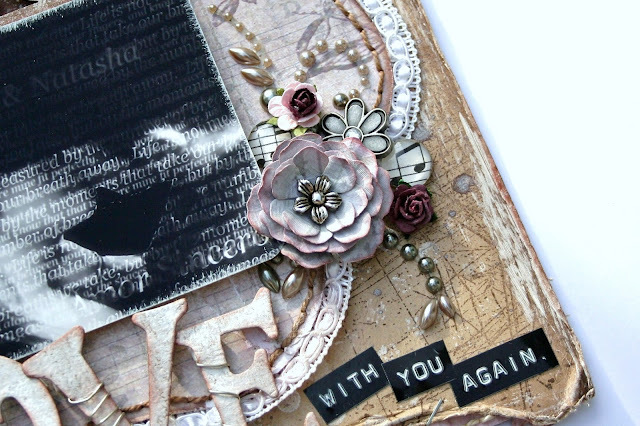 This flower was made using Donna Salazar's Rose Creations dies. You can find a tutorial for this flower HERE. The edges of the flower were inked with her new Mix'd Media Inx in Chiffon. If you haven't tried these inx yet, you must! Do you see the music notes pebbles around the flower? These are from Handmade Halo. Corinne has an AMAZING variety of embellishments. Be sure to check her out HERE. You can also become of a fan of her Facebook Page by clicking HERE. I'd like to send a big THANK YOU to Artistic Wire for sending us some wonderful products! See the little wire heart in between the photos? That was made using Artistic wire. 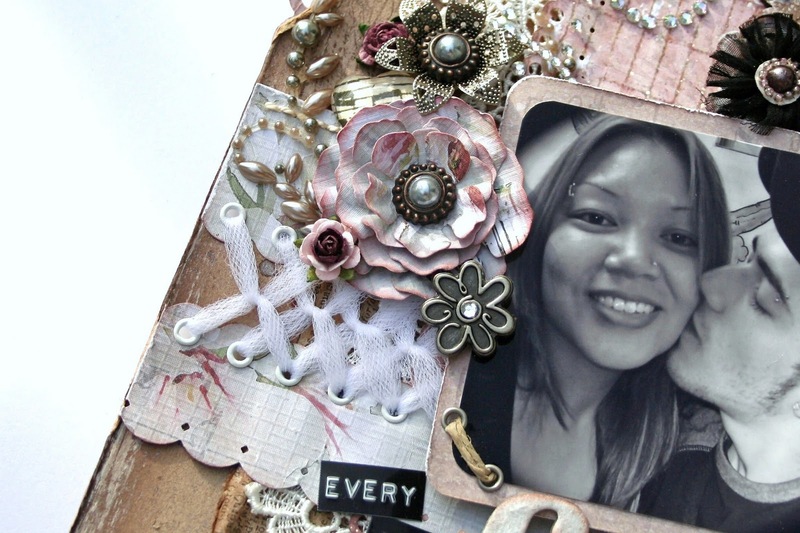 The possibilities of wire embellishments are endless! All you need is an imagination and some wire. I also used wire to adorn my title letters. Just a little wire wrapped around them adds a funky touch. A touch of tulle softens the feel of this layout. You can find a tutorial for my lacing HERE. Can you see the cute heart-shaped pebble from Handmade Halo hiding behind the flower? I created these hand-stitched flourishes by stamping a flourish stamp onto my paper using a color that blends in with the background, yet is still noticeable. I then used a craft pick to pierce holes along the stamped flourish. Then I stitched away! The rhinestones were added for interest. 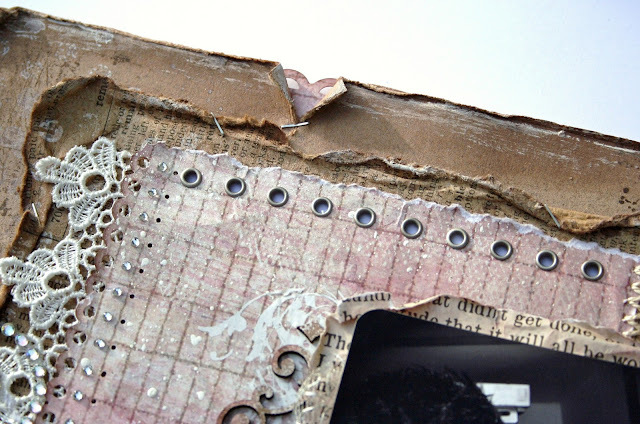 The background paper is actually a plain sheet of kraft paper that I stamped, inked and painted for a grungier look. Donna's Inx in Jasmine is perfect for creating a painted effect without the paint! After hand-stitching the border of this paper, I adhered a decorative trim to the edges. Most of the edges of the papers were inked with Mix'd Media Inx in Truffle. All of the chipboard elements, including this bracket, are manufactured by The Dusty Attic. And as always, I couldn't forget my eyelets! I love metal embellishments! 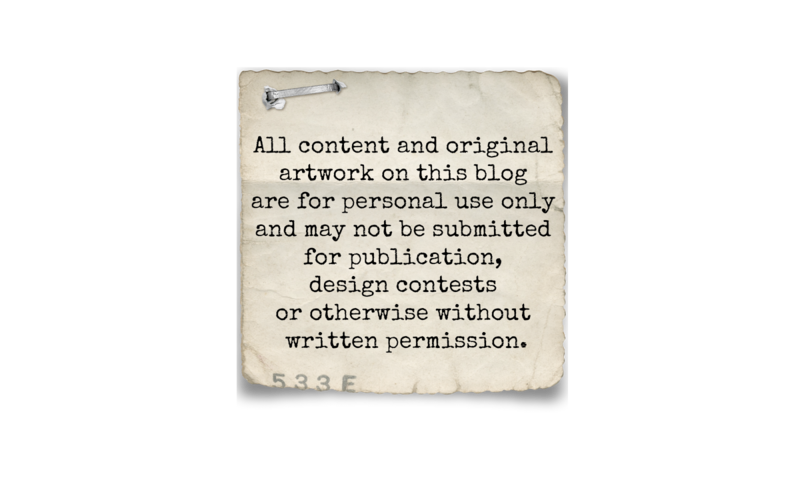 Behind the photo, I tucked away pieces of The Crafty Chronicle. Aside from being interesting reading material, The Crafty Chronicle can be used to embellish, make flowers and create beautiful layers. Thank you for stopping by! I hope you all have a beautiful day! Beautiful like always!! Love the pic with the mask layering and of course all the little details that make it you. OOOO! LOVE! 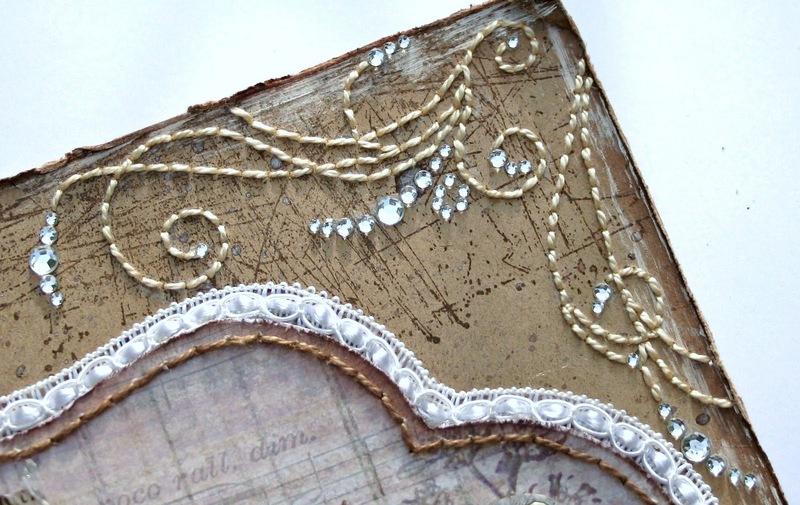 The bling on the ends of the stitched flourish is such a GREAT detail!!! I will be heading off to "artistic wire" next to check that out- you asked me if I had a metal mesh source- not yet!! I was just looking at some industrial chicken wire the other day wondering why no one has thought to put that in a more flexible format for scrapbooking- I got some really pretty butterflies from CraftySprinkles' Etsy but that was a long time ago. 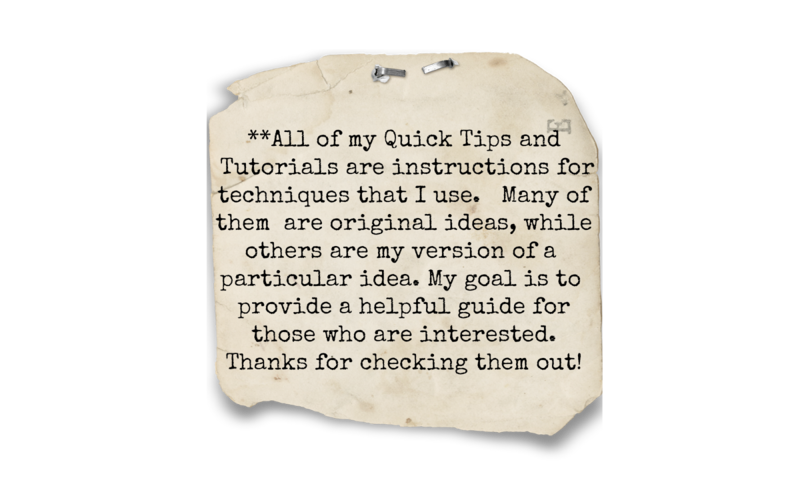 I also use RedLead- an ATC/stamp online store- to find cool rusty metal embellies but I haven't seen the metal mesh in a while- I'm checking my stash to see if I can't find some and send it to you. 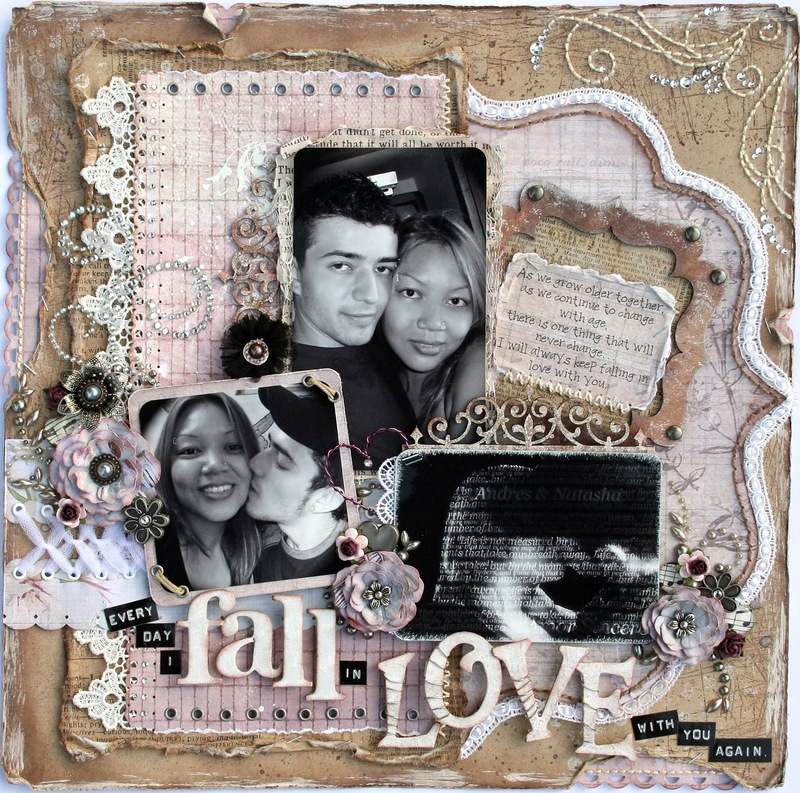 LOVE the work you're producing for Donna S- you guys are a seriously perfect fit- I LOVING this page and this collection! This is a BIG ask- is there any way you can do a video of how you stitch? I just need the help so badly! My stitches are never EVER even- you are the craft QUEEN woman! Beautiful, beautiful, beautiful! Gorgeous too! 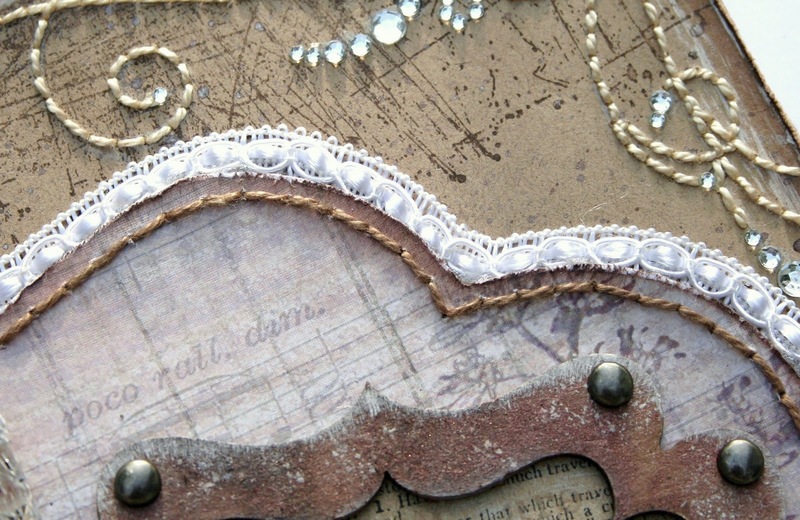 I love the hand stitching, your corner swirl is wonderful! Great embellies! I just love all the detail you put into every piece you do! I love this too.....just gorgeous and that stitching is amazing! 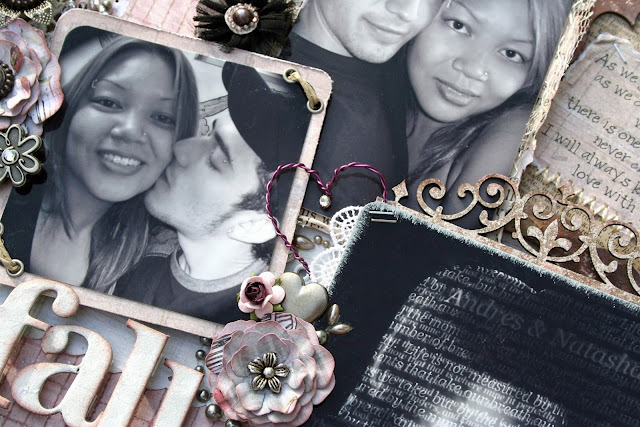 I love what you did masking the word paper onto the kissing photo. Very creative. 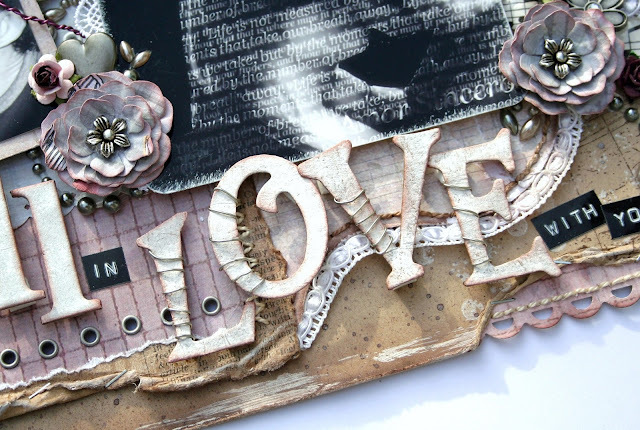 Hi.. this is stunning.. you have so many details and thank you for sharing your tips and techniques too.. exquisite layout..
Oh my goodness! The queen of lacing and layers did it again! This is sooooo pretty. I am stunned. That stamp and sewing combo is brilliant! Hope you don't mind if I lift it? Stunning work.